Had a good nights sleep, Tina said she needed to catch up after early starts. We still were ready for breakfast at 8.30 though. We decided to visit the hotel buffet breakfast offering; $34 for an all-you-can-eat affair. We didn’t eat much, but Tina spotted one woman eating two full plates of food at the same time. Then she went up for another. Back up to the room to prepare for a full day of sightseeing. We firstly walked across the strip to buy some tickets for a show; we spotted that Lion King was playing and so we thought we’d treat ourselves. As we waited in line Tina noticed that black clouds were looming overhead, an ominous sign of the rain that the waiter yesterday was yearning for. Tina then returned back to the room to get a cardigan whilst I continued to queue. Once I paid for the tickets the skies were really dark and the wind picked up too so I rang Tina to get her to grab a jumper for me too. 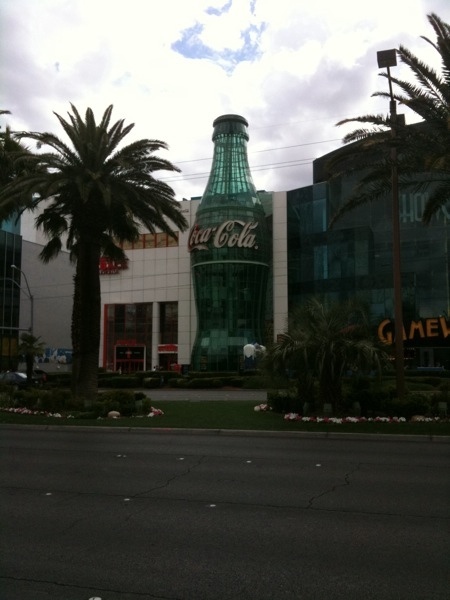 We then started walking towards the Mandalay Bay hotel which is at the extreme south of the strip and where we needed to collect the tickets for the performance tonight. The large hotel looked a lot closer that we’d realised and it took nearly three quarters of an hour to get there and that included a short tram ride too. 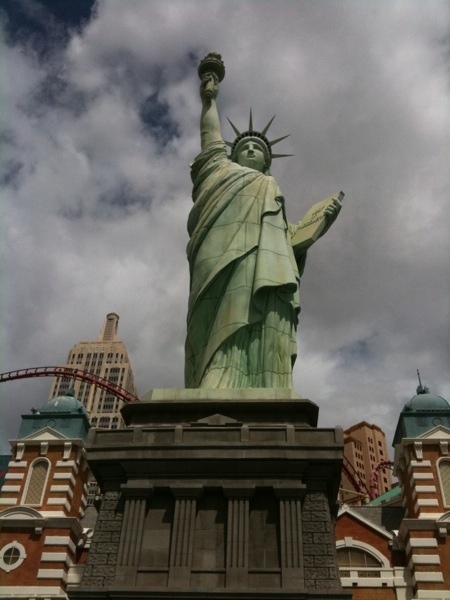 On the way we passed the themed hotel and casino called New York New York hotel that had a large statue of liberty outside, The Luxor, a huge glass pyramid shaped hotel with many egyptian temples surrounding it. Once we collected our tickets we then continued south, walking towards the ‘Welcome to Las vegas’ sign which meets visitors as they arrive. 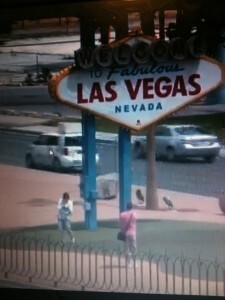 The sign also is covered by a live webcam which was the main reason for going there. We had timed it so that both Matt & Abby were going to be around to be able to view us live. Tina rang Abby as soon as we arrived, but firstly the obligatory photo of us both standing under the sign, kindly taken with my camera by someone who just happened to be waiting there. She was rewarded by a $2 tip. We then had to wait around for Matt & Abby and various others that had been told we were there, us waving frantically in the direction of a large sign the camera was housed on, much to the confusion of others that were at the sign. Matt subsequently sent me a photo that took from the webcam showing Tina and I there. We then left to head back to the strip, by this time Tina’s feet were suffering due to a couple of blisters. Luckily we were able to hail a taxi cab and were shortly back at the Bellagio for a change of shoes. A quick drink then we were off again, this time heading north towards The Venetian, another hotel, shopping and casino complex. I was previously advised that this was a must-do place and we were not disappointed. 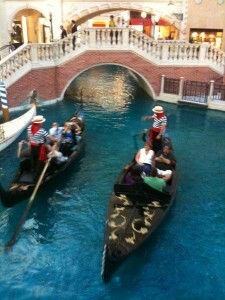 On entering the shopping area the shops are set out as Venetian streets with blue skies adorning the ceilings. Just passed the first shops we located the main attraction, a canal system with gondolas and singing gondoliers serenading their passengers to the entertainment of those watching from the side. Further up was St Marks Square, where there was some street entertainment, some restaurants and a Pandora jewellery shop. More of that in a minute. I said I was going to take some photos of the sights, whilst Tina disappeared…into the Pandora shop. After ten minutes or so I realised Tina was still in there and so I went in to find her being shown a necklace and trying to choose some accessories for it. Shortly after Tina had her birthday present sorted. 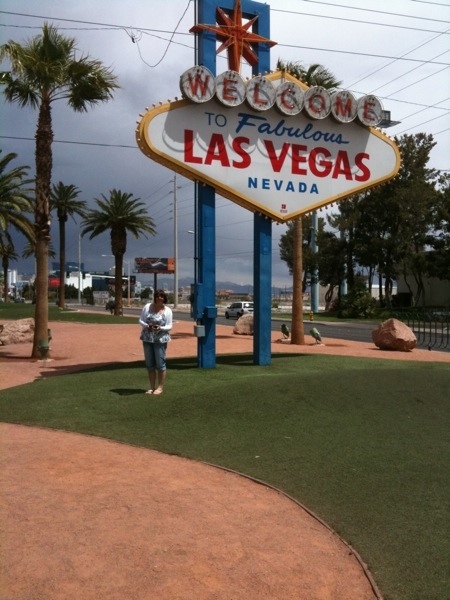 We headed towards the Monorail system that stops at various points along the strip and used it to get back to the centre, where we then stopped for coffee and Tina had some lunch. After purchasing a pair of flip flops for Tina (to hopefully stop any further blisters) we walked back to the Bellagio, watching a day time performance of the water fountains outside, which was just as good as last nights performance. Tina had spotted some perfume that she liked at a Gucci store so it was a quick detour to buy that before heading back to the room once again for a rest. Off out in the car after showering, we made our way to the Mandalay Bay hotel for the show. This hotel had a massive car park that allows visitors to park, free of charge and get to the casino or theatre easily. 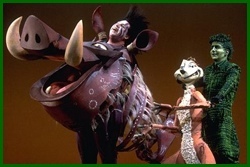 The show was very colourful and true to the original cartoon film, although many of the songs we were unfamiliar with. Well worth going to see and Tina is now going to try to book up to see the West End version of the show again with Abby. As we hadn’t eaten a meal, we were unsure where to go, but ended up enjoying a nice dinner at one of the hotels restaurants. I had lamb and mash, whilst Tina had pasta. We had another wander around the casino watching a few of the games being played. The way people just chuck money away at roulette fascinates me. One guy asked for $100 of chips, spread bet them all across the numbers and won $300 straight away. He then did exactly the same thing again with all the chips he had just won but this time he lost. And that was it. $300 gone in one spin of the wheel. Didn’t he know that the house always wins? He left the table. Exhausted, Tina and I walked back up to the hotel room after another full on day.